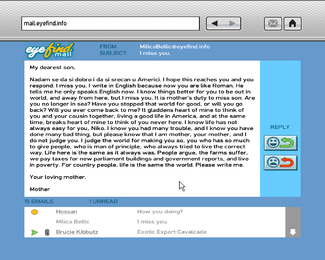 An e-mail by Milica Bellic addressed to Niko Bellic on mail.eyefind.info in GTA IV. mail.eyefind.info, also known as EyeFind Mail, is one of the many websites introduced by the GTA IV era. It is an e-mail service offered by eyefind.info in Grand Theft Auto IV, The Lost and Damned and The Ballad of Gay Tony that Niko Bellic, Johnny Klebitz and Luis Fernando Lopez can all access from any computer in the game. The e-mails can be from friends, Niko's mother, they can start missions, or they can just be random spam. Most e-mails throught the games are a means of communication, to add detail to important parts of the storyline. The player cannot reply by typing themselves though through either replying using the positively or negatively button to e-mails from other characters. There is only a delete option for spam, however. Selecting emails that have been replied to only have the delete option, unless it is for an Exotic Export car theft missions (in which case the car must be successfully stolen and the mission successfully completed). Read emails will be marked as read when you browse through them. Spam e-mails generally contain useless or explicit information. Some however will link to other fictional in-game websites or may refer to places in Liberty City. It is through e-mail that Niko receives the Exotic Export car theft missions from Brucie.